Visiting Ireland has always been on my bucket list. My mom’s side of the family is Irish and I have already been to Italy where my Dads family is from, so a trip to Ireland was long overdue. Last week I had the chance to visit Ireland, I spent 3 days in Letterkenny the town that my family came from and then 5 days in Dublin. Ireland really took my breath away and 8 days wasn’t nearly enough to explore all that Ireland has. 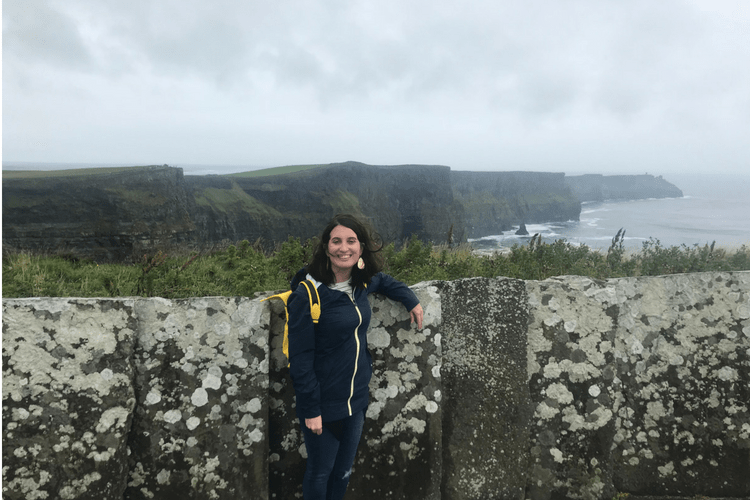 I felt like I was only just getting to really know Ireland and it was time to head home. It’s definitely a place that I plan to go back to. 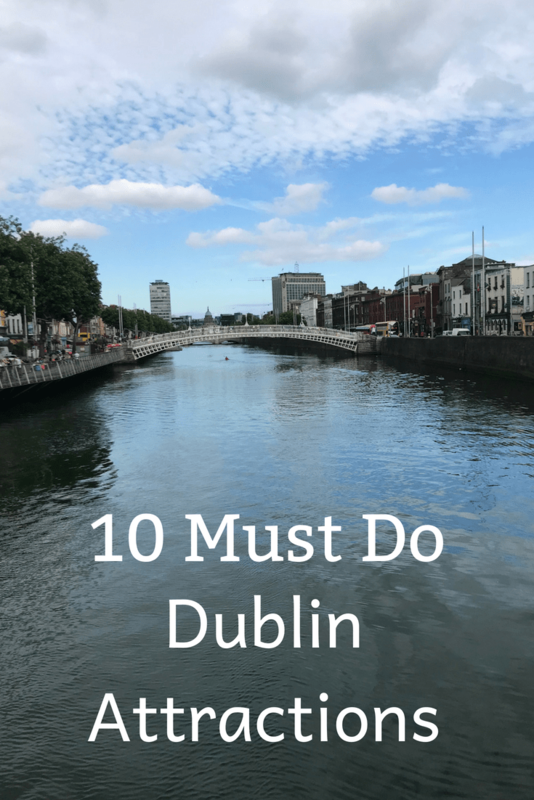 Dublin is a great place to base yourself in if you want to experience Ireland from a centrally located place. It’s easy to fly into and it’s a city that is small enough to walk but filled with so much to do that you can really get a feel for Ireland. You can’t walk down a street in Dublin without finding a pub. It’s fun just to pick one and pop in for a drink and then continue on to another. Make sure to visit the Temple Bar, one of the most popular pubs in Dublin. While there we heard a mix of Trad music and some American favorites. Oddly this place reminded me a lot of Sloppy Joe’s in Key West, FL with its welcoming atmosphere and cold beer. There is nothing better than being in an Irish Pub in Ireland listening to some Trad music. The first night I experienced it, it was surreal. Trad music in Ireland is unlike anything we have here and it’s wonderful to be in a pub as everyone sings along to Molly Malone. We enjoyed Trad music at Murphy’s Pub, they also feature Irish Dancing after 10 pm. 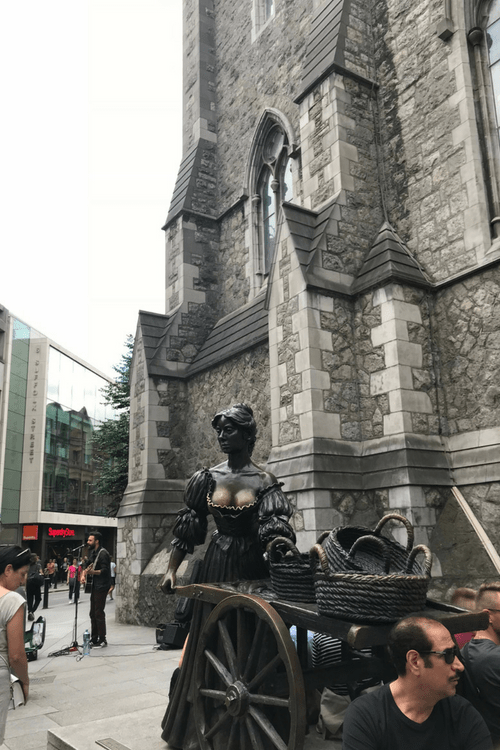 The song Molly Malone is the unofficial anthem of Dublin. Molly’s statue is on Suffolk street and makes for a great photo opp. Also, notice how the bronze has been worn down due to handy tourists. 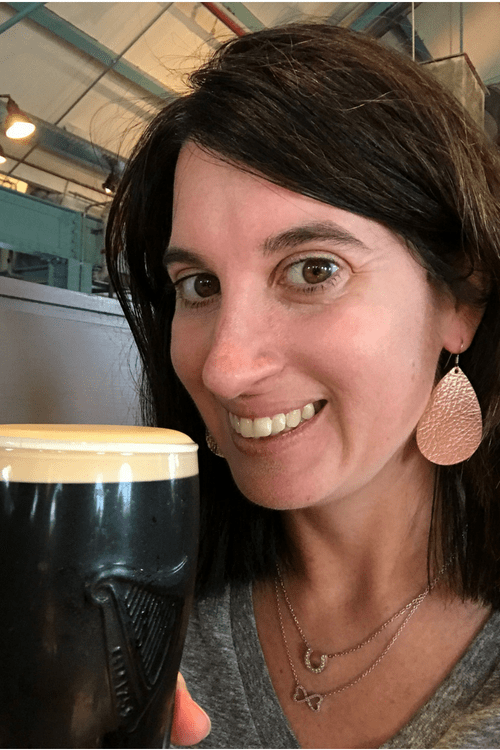 You can’t go to Ireland without having a Guinness and the best place to get a Guinness is at the Guinness Storehouse in Dublin. With 5 levels of Guinness fun including a 360 bar with a view of Dublin, a chance to learn how to perform the perfect pour, fun photo ops and great food. When visiting the Guinness Storehouse make sure to save some room for food. Everyone in my group agreed that this was our favorite meal. The Guinness beef stew is not to be missed and for a real experience try the oysters with a pint of Guinness. There are several places around the city to sample Ireland’s favorite spirit, whiskey. You can visit the Irish Whiskey Museum , The Jamison Whiskey Distillery or one of a few other Whiskey Distilleries in town. We choose to visit Teelings Whiskey Distillery, which gave you your choice of 4 tastings: non-alcoholic cocktail for those under 21 or who don’t enjoy whiskey, a sample and a cocktail, a 3 flight tasting or a 3 flight tasting featuring one of their higher priced whiskey’s. We choose the standard 3 flight tasting and found them all to be good, well I liked them all I’m not sure what everyone else thought about them. Dublin is designated a Unesco City of Literature, which means that Dublin specializes in literature. As a writer and former Litt major, I loved this. Everywhere we went people were talking about James Joyce and Oscar Wilde, among other great writers. 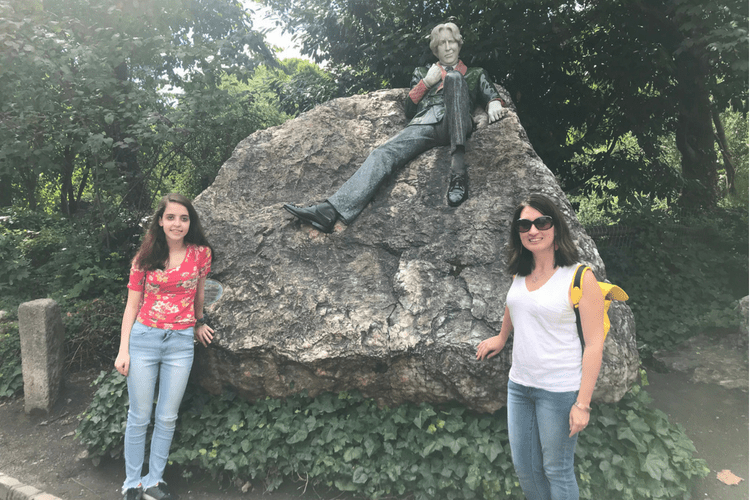 We visited the Oscar Wilde Statue and the Dublin Writers Museum. Many museums in Dublin are free including the National Gallery of Ireland. My cousin and I had some time before meeting up with the rest of our group and since we were near the National Gallery we decided to check it out. The National Gallery of Ireland features lots of great works from Irish artists and we loved seeing the paintings that dated back 100’s if not 1000’s of years. On our first day full day in Dublin, we decided to do the green Hop On Hop Off bus. There are several Hop On Hop Off buses in the city, the green one was recommended to us by a few people. The tour stops at every major and minor attraction in Ireland and gives you information about the sites and about the history of the city. On a nice day sitting in the open air second level gives you a nice view of the city. 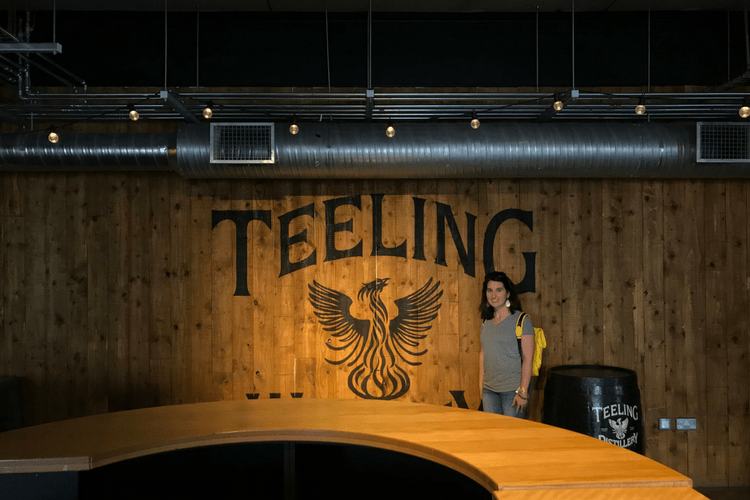 This tour is also a good way to get to the Guinness Storehouse and Teelings Whiskey Distillary which are a little off the beaten path. Trinity College located in the heart of Dublin was established in 1592 by Queen Elizabeth I and is still open today. At Trinity College, you can visit the Book of Kells which includes the 4 Gospels written on Velum and was believed to have been created in 800 AD. The pages are beautifully illustrated and you can view them in illuminated versions and see the original book. 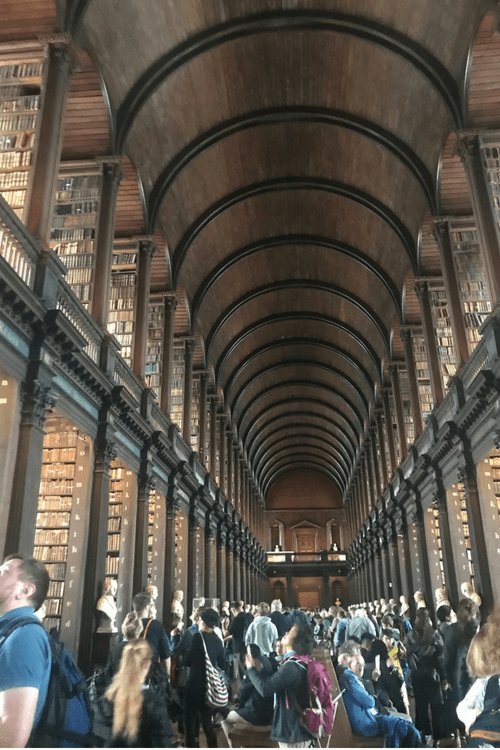 Also at Trinity College is the Long Room or the Old Library which is said to have been the inspiration of Hogwarts Library in the Harry Potter series. If you love old books, this place if for you. I loved Dublin. I think that sometimes it could be overlooked due to so many other great cities to visit in Europe but I know that it is the nicest city I have ever visited. It is safe, clean and friendly and beautiful. I loved walking down the cobblestone streets and crossing the River Liffey. You can feel that the city has so much history and it embraces it so well.